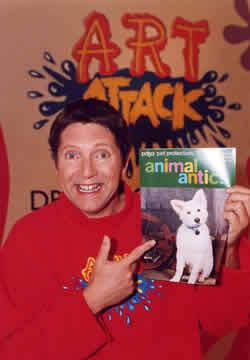 Britain's leading veterinary charity, PDSA, and Art Attack presenter Neil Buchanan, are suggesting an alternative gift for young animal lovers this Christmas, membership of PDSA's young people's club - Pet Protectors. "Christmas is a stressful and hectic time for the whole family and is definitely not the ideal time to introduce a new pet," says Neil Buchanan, Art Attack presenter and Pet Protectors Club President. "Membership of PDSA's Pet Protectors club, however, is an ideal present, providing children with a year of opportunity to discover the real responsibilities of owning and caring for a pet," continues Neil Buchanan. The Pet Protectors club is open to young people aged five to sixteen years old. Membership is £6.50 and those signing up to the club receive a free gift, personalized membership card, pin badge and regular copies of Animal Antics, the club magazine. Animal Antics, is issued every two months and is crammed with animal facts and features, competitions galore and lots of opportunities to help PDSA. Further information about the club is available on the PDSA website, www.pdsa.org.uk or from the Pet Protectors office, PDSA, Whitechapel Way, Priorslee, Telford, Shropshire, TF29 PQ, telephone 01952 290 999 or e-mail petprotectors@pdsa.org.uk.